Winner of five Tony Awards, including Best Book and Best Original Score, The Drowsy Chaperone will open at 7:30 p.m. Wednesday, April 19 at Southern Illinois University Edwardsville’s Katherine Dunham Theater. The musical, which is set in the jazz age and features one show-stopping song and dance number after another, runs at 7:30 p.m. from Wednesday, April 19-Saturday, April 22. A matinee is set for 2 p.m. Sunday, April 23. General admission is $12 for adults, and $10 for seniors and others (non-SIUE students with a valid school I.D., SIUE retirees, alumni, faculty and staff). Discounted tickets are available for groups of 10 or more. SIUE Theater and Dance shows during the main season are not recommended for children under the age of 12. Since its original Broadway version in 2006, The Drowsy Chaperone has been hailed by New York Magazine as “The perfect Broadway Musical.” The Drowsy Chaperone is a masterful meta-musical, poking fun at all the marvelous clichés that characterize the musical theater genre. With the houselights down, a man in a chair appears on stage and puts on his favorite record: the cast recording of a fictitious 1928 musical. The recording comes to life and The Drowsy Chaperone begins as the man in the chair looks on. Mix in two lovers on the eve of their wedding, a bumbling best man, a desperate theatre producer, a not-so-bright hostess, two gangsters posing as pastry chefs, a misguided Don Juan and an intoxicated chaperone, and it is the ingredients for an evening of madcap delight. As a special treat, the Theater and Dance Department will collaborate with Vertigo, previously Hall Associates Flying Effects, to bring an airplane on the stage. Marc Schapman, associate professor in the Department of Music, is the director. Schapman also serves as a voice teacher for Opera Theater of St. Louis’ Artists-in-Training and is the program coordinator for the Opera Theatre of St. Louis Spring Training program. Schapman’s artistic crew includes Jon Garret, musical director; Roger Speidel, set design; Joseph Clapper, lighting design; Dr. Laura Hanson, costume design; James Blanton, sound design; and Katherine Slovinski, props designer and stage manager. 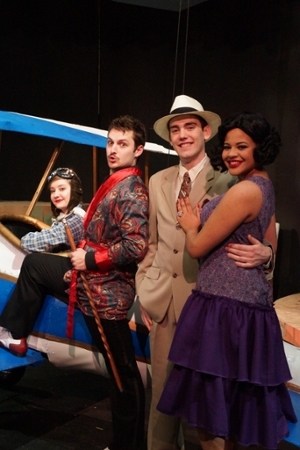 The student actors are Zora Vredeveld (plays Trix), Oliver Bacus (plays Aldolpho), Brandon Janssen (plays Robert) and Maika Miller (plays Janet). For tickets, contact the Theater & Dance Box Office at 650-2774 or toll free at 888-328-5168, extension 2774. SIUE’s Department of Theater & Dance presents four plays and one dance concert during its October-April main season. All productions are open to the community at large. The Department of Theater & Dance is part of the College of Arts and Sciences. For more information, visit siue.edu/artsandsciences/theater or email theater-tickets@siue.edu.